If you’re a former child soldier, being accepted into an elite international school on a cricket scholarship doesn’t mean your life is going to change. Except it does, because hunky Indika – I for Indika, I for Incredible – takes you under his wing, drags you to posh restaurants and shows you pictures from glossy magazines of women who … well, never mind, that’s not the point. The point is: if your best friend snogs your girlfriend, can he still be Incredible? Was he ever? But don’t sweat the small stuff. There are cricket matches to win, examinations to pass, a horrifying past to forget, a sinister schoolmaster to avoid … and, of course, a first kiss to finally experience. Prabu’s life is never going to be the same again. Funny, diamond-sharp and unapologetic, ‘Panther’ is a novel about that familiar, fractured passage to adulthood that can make us magnificent if it does not kill us. After the critical and commercial success of ‘The Amazing Racist,’ the release of ‘Panther,’ ChhimiTenduf-La’s second book, is eagerly awaited. Published by HarperCollins India, Panther is now available in Sri Lanka, ahead of its official launch elsewhere. 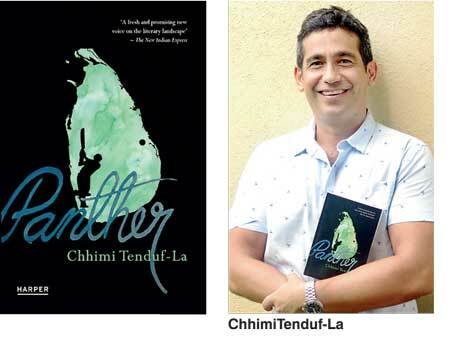 Chhimi Tenduf-La will be at Barefoot Café Book Shop between 11 a.m. and 4:30p.m. on 20 June to sign copies of ‘Panther’ purchased there. ‘Panther’ is available at Barefoot, Vijitha Yapa, Trunk (Cinnamon Grand and Ramada), Odel, Paradise Road, Sarasavi, MD Gunesena and Expographics. Also available online at Takas.lk.